Ten-Year Veteran	 Though the ELR's roof line sweeps all the way to its spoiler, it has a trunk, not a tailgate. Ten-Year Veteran	 Running the A/C on max will dramatically reduce the ELR's range. Ten-Year Veteran	 Because I have only a standard electrical outlet at home, I ended up using a fair amount of gas. Ten-Year Veteran	 The Chevrolet grades its drivers. The Cadillac lacks this feature. Ten-Year Veteran	 Optional brown leather seats add manual thigh support and power-adjustable bolsters. Comfy. Ten-Year Veteran	 Tight and hard to get into. Battery pack is in the high console. Ten-Year Veteran	 Adequate trunk space, given the typical roles of a coupe. Ten-Year Veteran	 Gas engine largely serves as a back-up, but must be summoned for peak power. Ten-Year Veteran	 Yellowish-green leaf on the left suggests that my acceleration is moderately efficient. Ten-Year Veteran	 Also as in other recent Cadillac's the touch-sensitive controls can be finicky. Ten-Year Veteran	 The vast black surface beneath the windshield can turn the ELR into a solar oven. Ten-Year Veteran	 Dramatic angles, especially in the shoulder. 20-inch wheels are plenty big. 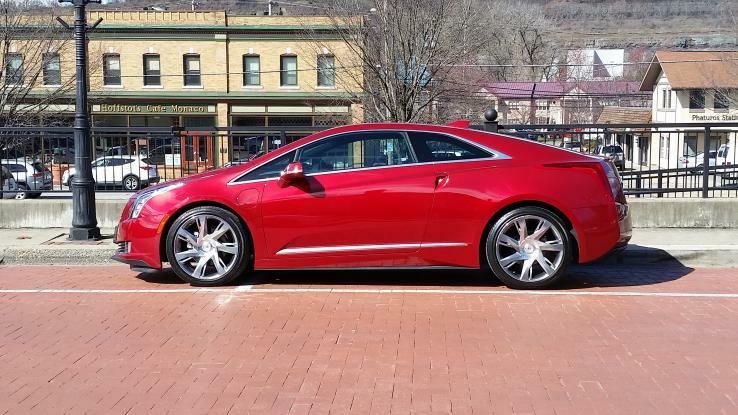 Ten-Year Veteran	 Production ELR exterior holds true to the stunning Converj concept. Ten-Year Veteran	 Production Chevrolet Volt mimicked the shape of the Prius. No one will confuse it with the ELR. Ten-Year Veteran	 The ELR is nine inches longer than the Volt, all of them in the pointier nose and tail. Ten-Year Veteran	 The Volt is a hatchback. Ten-Year Veteran	 I found a free, fast public charger in a parking garage. 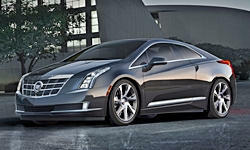 Ten-Year Veteran	 Like other recent Cadillacs, the ELR's interior melds a dizzying number of upscale elements. Ten-Year Veteran	 The Volt's interior tries to capture that clean, futuristic Apple flavor. Ten-Year Veteran	 Vertical lamps (LEDs here) a Cadillac signature. Large grille largely blocked off because electric.